get tickets in advance below! Special Gay Pride edition of Bootie Seattle! Madge (and other divas) mashed up throughout the night! 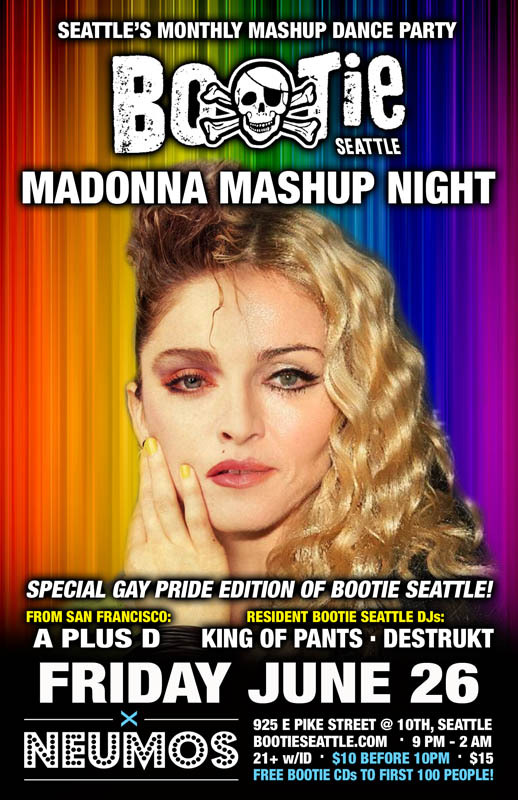 This just may be the gayest mashup party evah, as Bootie Seattle presents a special Gay Pride edition – it’s Madonna Mashup Night! Bootie creators and DJs A Plus D will be coming up from San Francisco to join Bootie Seattle resident DJs King of Pants and Destrukt as they pay mashup tribute to Madge – as well as other divas – throughout the night! No genre, era, or artist is safe! Launched in 2003 by San Francisco DJ duo A Plus D, Bootie was the first club night dedicated solely to the then-burgeoning artform of the bootleg mashup — and is now the biggest mashup event in the world, with regular parties in several cities on four continents. Voted “Best Club Night” for the past nine years, Bootie celebrates pop culture both past and present, keeping your brain guessing and body dancing with creative song combinations. Mixing and matching every musical genre, era, and style into one big dance party, it’s a place where everyone is welcome. And with free mashup CDs given away like candy, Bootie provides the soundtrack for the A.D.D. generation.